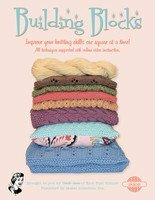 Building Blocks: Build your knitting skills one square at a time in a series of 12 fun patterns. Starting with simple knit and purl stitches, your confidence will grow as you progress through several major knitting principles. Each block focuses on new stitches and techniques in a sequential fashion that builds upon the previously learned skill. This class requires 12 months/sessions to complete. Building in Color: Continue to enhance skills you learned in Building Blocks (or through other knitting experience) by continuing to Build in Color. Learn to manage multiple colors and create a gorgeous sampler afghan knit in panels that are sewn together and finished with a simple border. This project requires 11 months/sessions to complete. Building in Lace: A carefully designed sequence of stitch patterns that introduce knitters to lace work starting with the basics and working towards more difficult stitch patterns to make one elegant shawl. The shawl is made up in nine sections, working one section each month of the class. This class requires 9 months/sessions to complete. Building Blocks requires 1400 yards of Aran or worsted weight yarn, a 24" circular needle size US 10, and the Building Blocks book. Building in Color requires 2800 yards of DK weight yarn (935 yards each of three colors), a 24" circular needle size US 6, and the Building in Color book. Building in Lace requires 1260-1370 yards of Rylie or other DK weight yarn, a 24" circular needle size US 6, size 6 beads, and the Building in Lace book. Price per 2-hour class. Receive a 20% discount if you pay for all 9, 11, or 12 sessions at one time. Materials are extra and must be purchased at Stitching Memories (20% discount offered on class materials).